1. 3M self-adhesive, super powerful to hold 15 to 20lb per hook on wall. Adhesive Hooks Size:4.5*4.5CM / 1.8"*1.8". HEAVY DUTY ADHESIVE HOOKS- self-adhesive, super powerful to hold 15 to 20lbs per hook on wall. Adhesive Hooks Size:4.5*4.5CM / 1.8"*1.8".Great for hanging shower and bath accessories, can hold umbrellas, scarves,towels, robes, bags, coats, keys, purses and baseball caps,dog leashes etc. EASY TO INSTALL- just peel off the protective layer in the back and stick it on the desired position (must be smooth surface ,like ceramic tile, metal surface ,glasses, etc.). 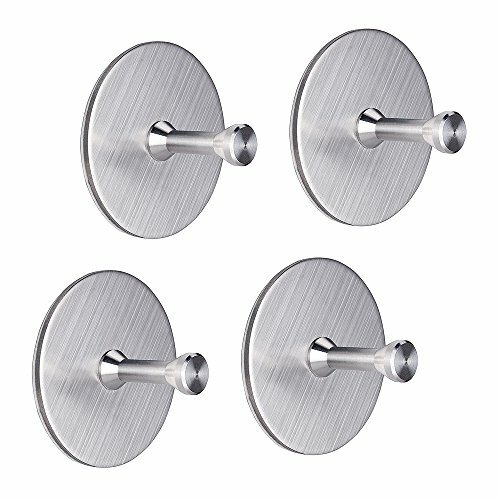 MODERN LOOKING-Premium Solid full stainless steel construction, ensuring quality and longevity, NO rust.No Scratch and no mark after remove the hook. WIDELY APPLICATION - Can be applied to a variety of smooth walls, such as ceramic tile, wood, glasses, metal surface, etc. Paint wall is not available it might damage your paint. FOTYRIG 100% quality assurance, not satisfied you can refund Or new replacement.Recommended to leave it on 24 hours before hanging any objects. You do not have to drill holes into the walls. If you have any questions about this product by FOTYRIG, contact us by completing and submitting the form below. If you are looking for a specif part number, please include it with your message.